Beverly Young Nelson says Roy Moore attacked her in his car when she was 16. Another woman has accused GOP Senate candidate Roy Moore of sexually assaulting her when she was a minor. 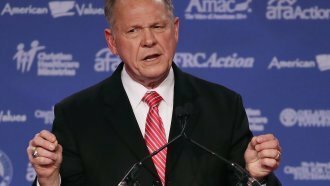 In a press conference with attorney Gloria Allred, Beverly Young Nelson said Moore made sexual advances and eventually assaulted her in the late '70s, when she was 15 and 16. Nelson says Moore attacked her in his car, grabbing her neck and trying to force her head toward his lap. She also said Moore told her no one would believe her if she mentioned the alleged assault. This comes days after Moore was accused of sexual misconduct with a minor and pursuing relationships with three other teenagers in a Washington Post article. That's led Republicans nationwide to pull their support for Moore's candidacy. Senate Majority Leader Mitch McConnell told reporters he believes the accusations and thinks Moore should step aside. Moore's campaign has denied the allegations detailed in the Post article and called Nelson's claims part of a "witch hunt."